Hi everyone, good to see you again for this month’s exciting new Power BI Desktop release (September 2017). With this release comes some very welcome additions, some of which I personally have been waiting for a while. 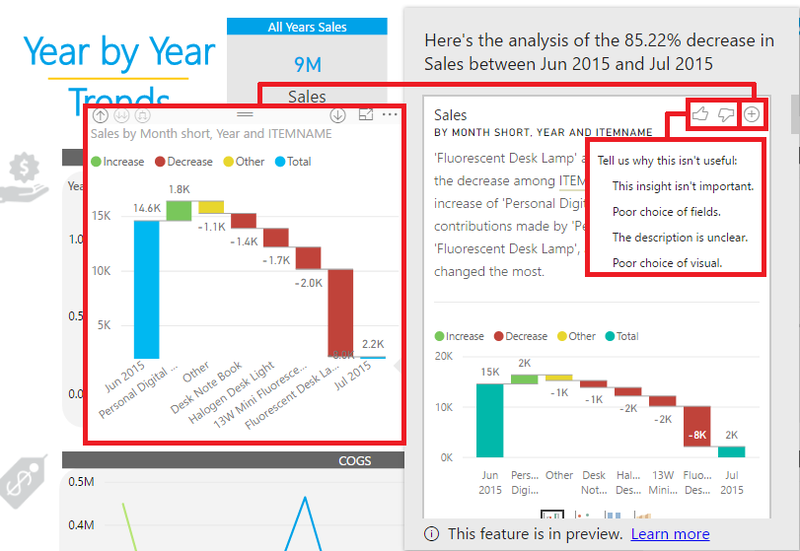 So lets jump right in to see what they’ve given us Power BI fanatics for the month of September 2017!! Let’s dig deeper to see how these new features work. 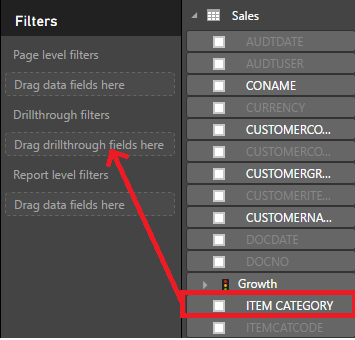 Drill-through filters: This feature allow you to create a page in your report that provides details on a single category or entity. Looking at the Data Bear Sales Demonstration, these could be for example Item Categories, Stores, Sales Persons, Products, or Locations. We start off by using any of these points and create a Drill-through connection between a data point referring to that ‘entity’ column and the page where the drill-through matched the filter context. 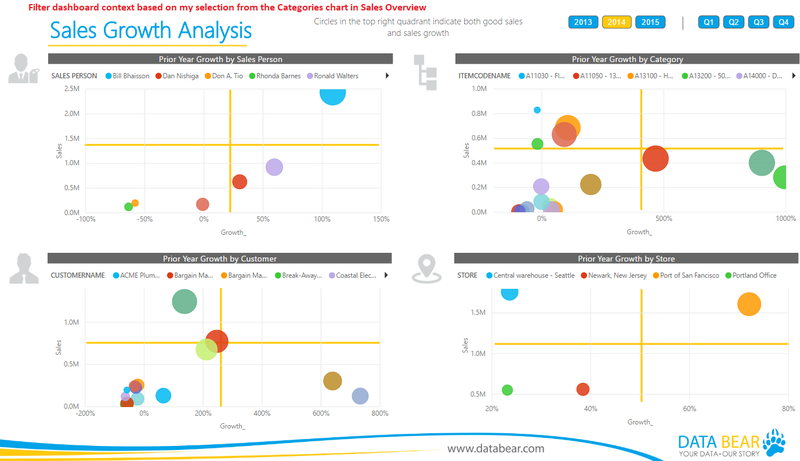 Below I have our ‘Sales Overview’ and ‘Sales Growth Analysis’ dashboards. I want to be able to drill through from the Category chart and view the selected category’s Prior Year Sales Growth, available from my newly created dashboard called ‘Sales Growth Analysis’. 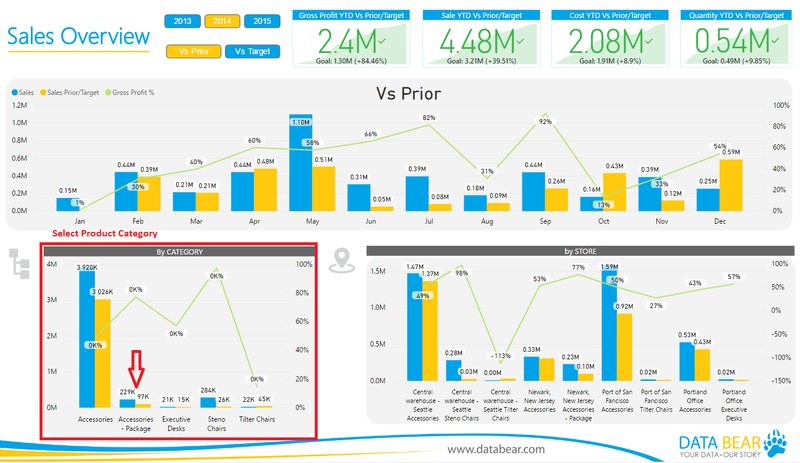 This dashboard shows the Prior Year Sales Growth by Sales Person, Category, Customer and Store. To create a drill-through page, start by creating a drill-through filter on the page where you want the filer context applied. In our case let’s add to the ‘Drillthrough filters’ field on the ‘Sales Growth Analysis’ report the ‘Item Category’ column. Click anywhere on the canvas (not a chart) to see the ‘Drillthrough filters’ field. Once the ‘Item Category’ field has been dropped in, notice that two things happened, it has added a ‘Item Category’ filter context to your report, and it has created a ‘Back Button’. You’ll notice when the button is selected, that it gives you some formatting options, where you can change the Fill, rotation, line, title, background etc. You can even choose your own button!! I formatted my button with a grey fill (This button makes me happy – I love buttons). Now this is where the action happens….let’s go back to our ‘Sales Overview’ report and follow these steps to apply and drill-through one of the categories. Right Click on the category you would like to use the Drillthrough filter for, let’s right click on ‘Accessories Package’. See the Drillthrough option from the pop-up and hover your pointer over it. 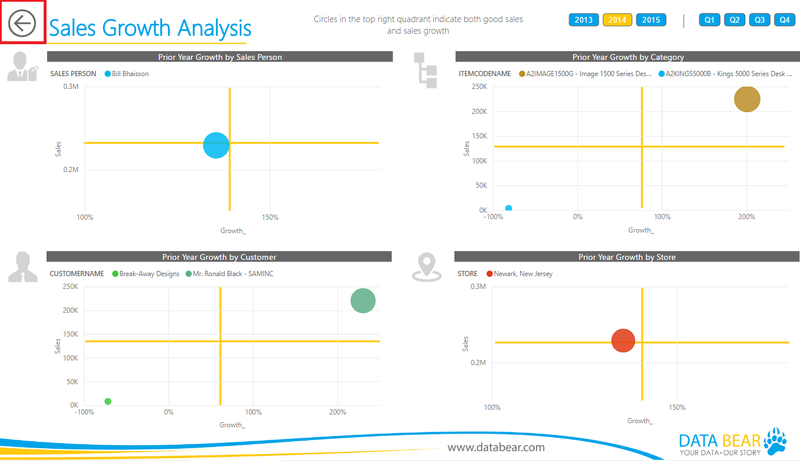 You’ll now see the filter context we created which points to the ‘Sales Growth Analysis’ Report – click on it!! How cool is that?! 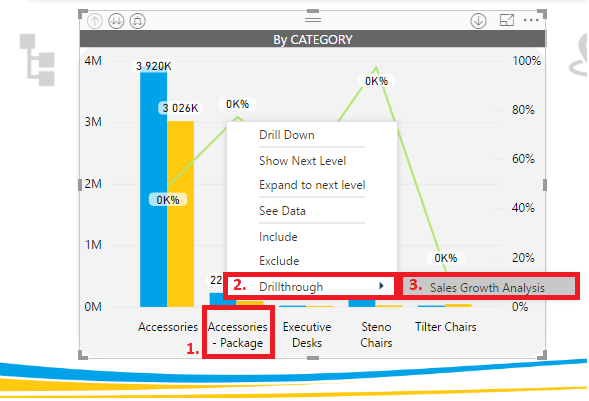 We can now see our ‘Sales Growth Analysis’ dashboard, filtered by our Category context for ‘Accessories Package’. Here is the best part: If you’re anything like me, you now don’t have to scroll through numerous reports to try find the ‘Sales Overview’ report again, use your nifty little ‘Back Button’ and use ‘Ctrl’ + Click to instantly go back to where you were and select a new category for deeper insight – yeah oh yeah, simple but a very welcome function for me. But wait, there is more – for any other dashboard where you have the ‘Item Category’ on a chart or table, you can use the Drillthrough we just created with any of them as well. This feature is really cool, reminds me of the custom visual ‘Narratives for Power BI’, now only built in as a preview feature. It let’s you select a point on any line or bar chart (not combo charts) and provides insights on why the data point has either increased or decreased compared to the point before it. Let’s see how this is done. Right click on the data point – let’s see what has happened in July. From the pop-up box, hover your mouse over ‘Analyse’. At this point the Insights machine runs learning algorithms over the data and populate a fly-out with charts showing what categories most influenced this increase or decrease. Use the scroll bar to view the different insights provided by the algorithm. You’ll notice that you are able to do a number of things here – you can view the insights of the results in different ways using the ‘chart-switcher’ at the bottom of the chart. I’ve made an extraction of all the different views to see which types are available. Hover over any of the data points to see more detail. If you find an insight which you really think adds allot of value, click on the plus sign on the top right of the insights chart to add the chart to your report. Because this feature is in preview, also use the thumbs up / down hands to provide feedback and improve this awesome feature. Oh I just love new visuals, and one of the visuals that are often used in business are the top and bottom rank of a chosen data field. This new Ribbon chart visual is aimed at showing rank change. The visual is like a stacked column chart, but each column’s inner categories are sorted according to their rank for that column. Additionally, the inner categories are connected by ribbons across the columns to help you visually see how the rank changes across the columns. Select the ‘Ribbon chart’ visual from the ‘Visualizations’ pane. From the ‘Calendar’ table, lets drag and drop the ‘Date’ column onto the ‘Axis’ field. From the ‘Sales Measures’ table, lets drag and drop ‘Sales’ measure into the ‘Value’ field. From the ‘Sales’ table, lets drag and drop the ‘ITEMNAME’ (Product Name) column onto the ‘Legend’ field. Ensure you have the ‘Fields’ pane selected. With the chart selected, go to the ‘Visual level filters’ and select ‘Top N’ from the drop-down list. Type the number of top values to filter into the box, we’ll choose 10. Drag and drop the ‘Sales’ measure into the ‘By value’ field. Click ‘Apply filter’ to filter your chart. So our visual is looking great, but it’s a little busy, and some of the ribbons overlap in a way which makes it difficult to see how value rankings have changed, let’s look at some of the additional formatting options. All ribbon formatting options can be found by clicking on the formatting pane (the one that looks like a paint brush), and clicking on ‘Ribbon’. Spacing: You can use this option to set a percentage of the column’s max height as the gap width between the ribbons. By default, there is no spacing. We’ll set ours to 20 – hey look at that, we can see all products separately – nice!!! Match series color: By default, we will color the ribbons to match the category’s color, but you can turn this off and the ribbons will be grey in color. Nifty feature, the grey and color combinations make it easy to spot the ranking movements. Transparency: You can control the transparency of the ribbon’s color. By default, it is set to 30. So even with color, a little transparency can make the movement pop out visually. Border: By default, the ribbons don’t have a border, but you can turn borders on. Even better visually………. As you can see, this new Ribbon visual brings some very colorful and beautiful insights to our businesses – a real win-win in my books. 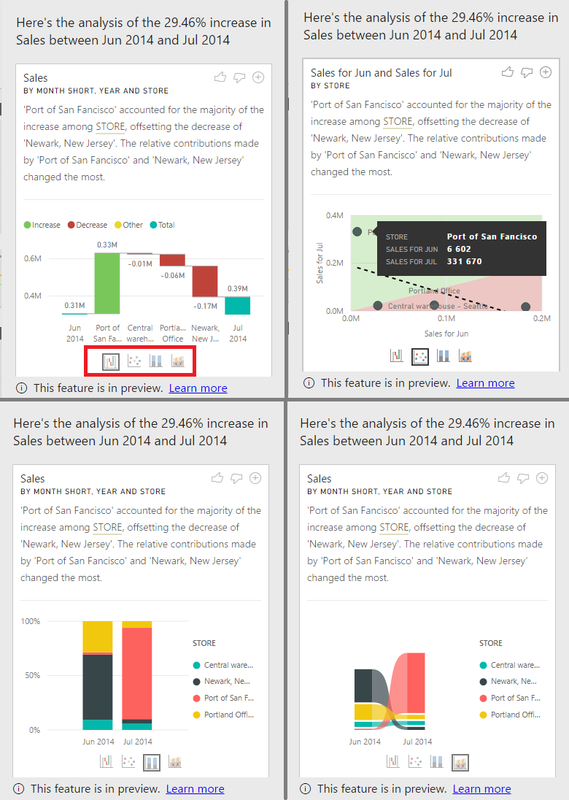 March 2017 was the first time we saw Power BI release the first iteration of the report theming feature. As always Power BI listens to their users and this month, they extend the theme file format to include full control over your chart styling – Awesomeness!!! Whereas with the March update, theming was limited to a few formatting variables, but with the new update of this feature – the power is in the hands of the user. Users can now can create one theme file with all their favorite chart formatting features on and almost never have to touch the formatting pane again! Yeeeeehaaaaaa!!! A real time saver…..and time is money!! Here is a default theme you can test out. If you don’t define a default setting in your theme, it will use Power BI’s default. This means you only need to define the defaults for the formatting settings you care about. 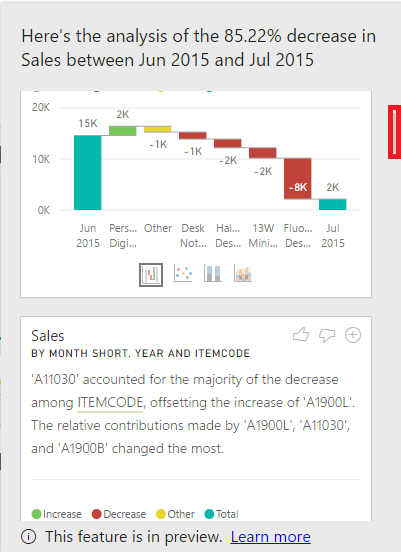 For all the specifics the exact theme definition, you can read Power BI’s documentation. Also remember to check out the Power BI Theming Gallery over HERE. 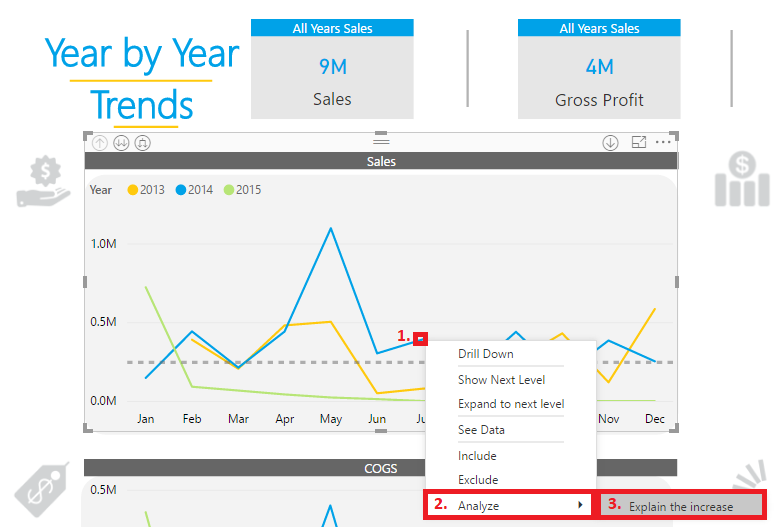 Also check out the detail Power BI post on using reporting themes over HERE. And that’s it folks!! 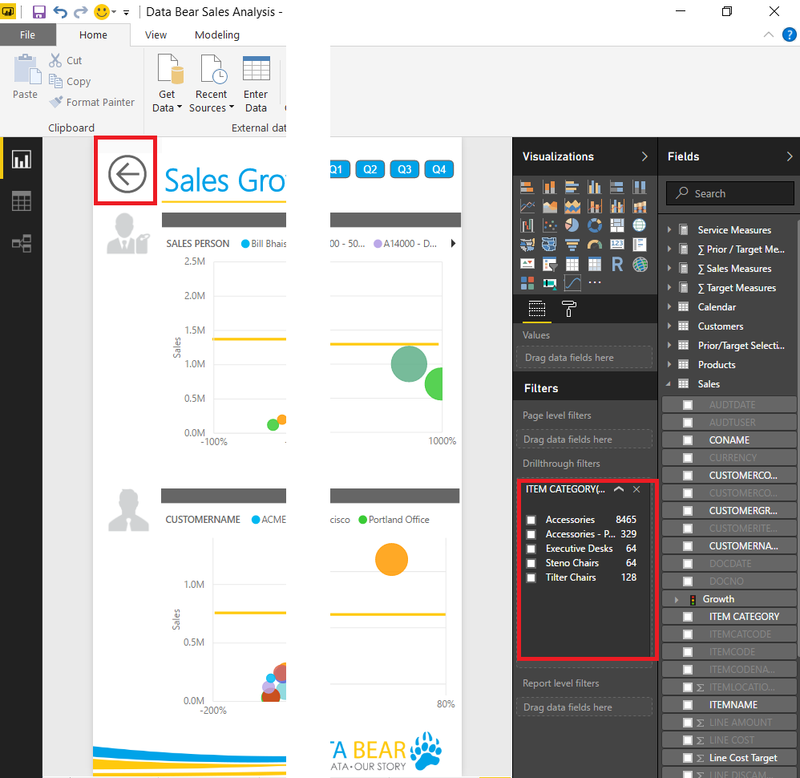 These are some very exciting updates and bound to make a huge difference in the lives of Power BI Developers and Businesses alike. For a review of the other updates, you can go HERE to see the remainder of the Power BI updates, all equally exciting!! So until next time, keep safe and stay blessed!!! Totally amazing articles and explanations.. Thanks.